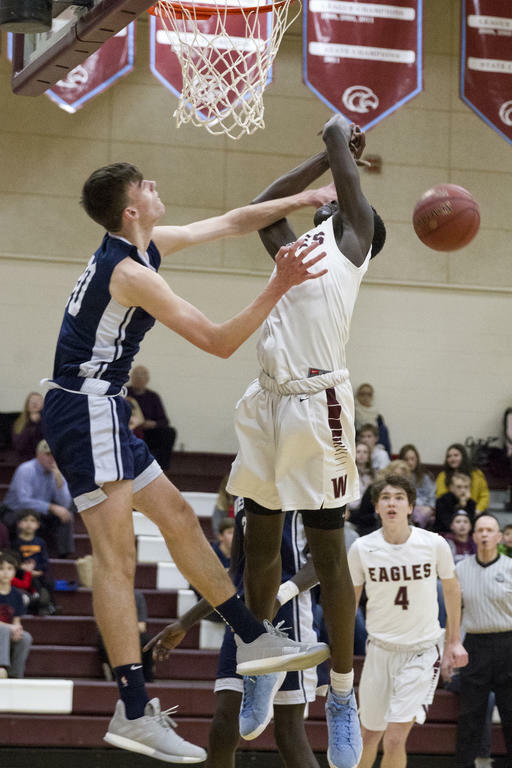 Westbrooker Michael Connolly rejects Windhamite Dierhow Bol. Windhamite Dierhow Bol pushes along the baseline toward the net. Windham’s Chris Naylor ascneds toward the net. Kaleb Cidre fires off a jumper for the Eagles. Abier Manyiel turns in transition for the Blazes. Westbrooker Kevin Malonda makes for the basket. Windham’s Cam Brown defends as Westbrooker Michael Connolly approaches on the attack. Braiden Pierce cuts inward on the attack for the Blazes.